Three community minded citizens and a popular local event will be recognised as part of the City of Mount Gambier Australia Day Breakfast celebrations to be held at the Railway Lands on Saturday 26 January 2019. “The Australia Day awards recognise individuals and organisations who have made a noteworthy contribution during the past year, and/or given outstanding service over a number of years, to our local community beyond normal employment duties,” City of Mount Gambier Mayor Lynette Martin said. Senior Citizen of the Year will be awarded to Lakes Rotary Club stalwart Graham Robinson. Graham has been involved with the club for more than 20 years and received Paul Harris Fellow recognition for his substantial contribution to educational programs. “He’s what I call a ‘can do’ rather than a ‘gonna’, he’s an engineer by trade, a retired TAFE lecturer and he can build anything. He’s a very good organiser and a good leader,” Nominator Phil Richards said. Graham takes the Rotary International motto ‘service above self’ seriously and thinks nothing of putting in 25 to 30 hours a week as a volunteer to assist many organisations throughout the community. He volunteers at the Mount Gambier Police Station for five hours every Monday morning to assist with customer relations. “I find it very rewarding, I happen to be a Justice of the Peace which also enables me to certify documents and statutory declarations at the same time,” Graham said. Graham has initiated successful local programs including the annual Science and Engineering Challenge at Tenison Woods College and the road safety car headlight check initiative. “He has put in many hundreds of hours of service for the benefit of the community over the years and he’s an unsung hero as far as I’m concerned,” Phil said. With a long list of volunteering efforts, Graham remains humble about his input into the local community. “In reality, I don’t see what I do as being special. Lots of people do lots of things for lots of organisations, it doesn’t matter what it is, and to be singled out I guess I’m surprised, but I’m happy to receive the award,” Graham said. Citizen of the Year will be awarded to local volunteer and business owner Sharon Tuffnell. Sharon was nominated by Ross Parkinson OAM for her community spirit, giving nature and ongoing generous support within the local community. “Sharon is a dedicated St John Cadet Officer and the effort she puts in to her cadets is absolutely outstanding. She is a wonderful leader, she is very caring and she applies opportunities for cadets to develop as young people not only in first aid, but their leadership skills and their inspiration to do good for others,” Ross said. As a Grade Five Divisional Officer at the Mount Gambier St John Cadet Division, Sharon provides support to enable young cadets to travel and compete in state first aid and allied competitions. “Our Cadet Division has grown to about 28 cadets and I see that my role is preparing the youth for their future, mentoring them, giving them leadership opportunities and setting them in good stead for community involvement,” Sharon said. Sharon is passionate about supporting the growth and development of local members of the community. Young Citizen of the Year will be awarded to Joseph McMahon. The 15 year old Grant High School student is dedicated to community service throughout the region, inspired by a desire to help others. “He is a stand out young leader with a humanitarian streak that runs very deep in his soul and all his endeavours are pitched at helping others and the quality of his involvement in the community is amazing for a young man,” nominator Ross Parkinson said. Joseph is a well-respected member of the St John Ambulance Cadet Division and completed Certificate Three in Basic Health in 2018 to become a certified First Responder. “I hope that I can inspire more of our youth to get out there in the community. In the future I hope to become a paramedic or work within the medical industry because I’m really passionate about helping others,” Joseph said. Demonstrating natural leadership and a genuine interest in making a positive difference within the community, Joseph has been a member of student representative committees and participated in a range of extra-curricular activities including public speaking, drama, sport and music. This year Joseph will prepare for the World Challenge where he will be joined by 10 other students to work with undeveloped communities in Cambodia and Vietnam to develop solutions to local environmental priorities. 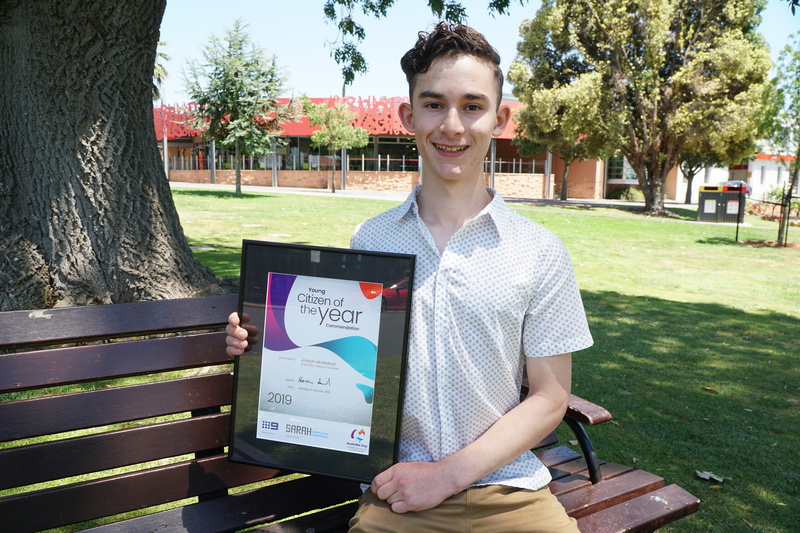 Joseph was also awarded South Australian Young Citizen of the Year (commendation) at a presentation at Government House in Adelaide earlier this week. “We have a very fine young man in our midst and we’ll see a lot more of Joseph in the future,” Ross said. The Community Event of the Year will be awarded to the 2018 Mount Gambier Fringe Festival, the second annual event of its kind held in the city. Mount Gambier Fringe was organised by a small committee with the aim to change the artistic and cultural landscape of Mount Gambier. 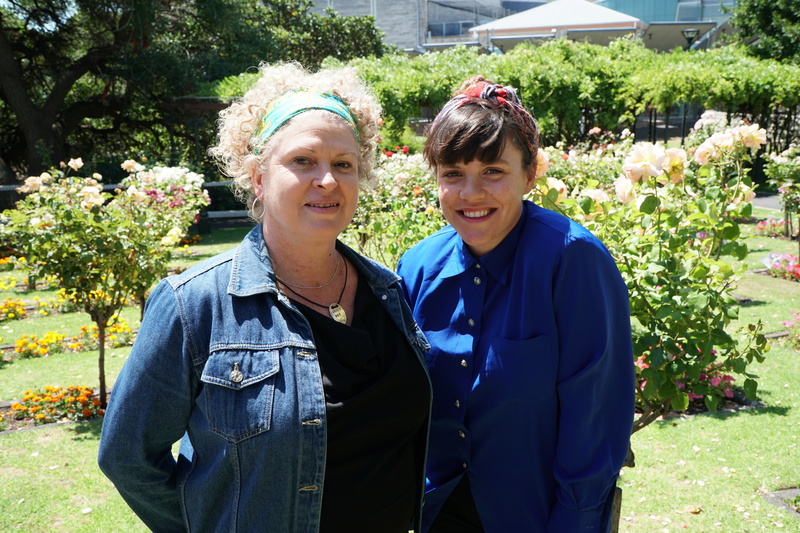 “We had a fantastic team of people as part of the committee, they were extremely passionate and determined to make this a fantastic event for our community,” Fringe Mount Gambier Event Coordinator Monica Hart said. In 2018, the committee delivered an extensive program including 24 performing arts events, six visual art / film events and two literary events throughout the city. The feature weekend held in March attracted an audience of 12,500 people commencing with the ‘Lift-Off Street Party’ which transformed Commercial Street East, and in partnership with businesses and performers, provided dynamic entertainment for all ages and set a new benchmark for street parties in the city. The Saturday Showcase event highlighted both local and national artists across a variety of genres encouraging performers and audiences to be brave, be bold and ‘come out and play’. “A big thank you to everyone in the community, our businesses, our audiences, anyone who has shown support for Fringe Mount Gambier, we really appreciate it, it makes the hard work we do so much more worth it and we just encourage you to get out there and be involved,” Fringe Mount Gambier Ambassador and Artist Liaison Louise Adams said. The awards ceremony is a key component of the City of Mount Gambier 2019 Australia Day Breakfast. “I am looking forward to seeing a strong crowd of people at the Railway Lands from 7:30am on Saturday for breakfast and local live entertainment and to join in the celebrations acknowledging the contribution of these people to our community. The awards presentation will then begin at 9:15am,” Mayor Martin said. Who makes a difference to our community? The 2019 Australia Day Award nominees and recipients have been announced and will be formally recognised at the District Council of Grant’s Australia Day celebration on Saturday 26 January at the Mil-Lel Memorial Park. Australia Day Ambassador, journalist Samela Harris, will assist the Mayor in presenting this year’s District Council of Grant Citizen of the Year and Community Event of the Year Awards. The awards recognise and reward individuals and organisations that have made a noteworthy contribution during the past year, and/or given outstanding service over a number of years, to the local community over and above normal employment duties. Awards recognise outstanding contribution and community service to any area that contributes to the advancement and wellbeing of the District Council of Grant community. Nominations closed in November and Council’s Elected Members selected the recipients in December. Mount Schank resident Peter Feast has been named as the recipient of the 2019 Citizen of the Year Award. Peter has been an integral part of the Port MacDonnell Landcare Group for almost 40 years and president for the past 23. Over this time he has driven several significant projects, attracting funding to the region to enable ongoing protection and management of existing native vegetation and extensive revegetation projects for on-farm benefits as well as long-term landscape change across the South East including Port MacDonnell’s Germein Reserve. Peter has been a pioneer in revegetation methods and a grower of local native species for our region. His legacy of revegetation over a 40 year period is evident everywhere in our landscape and continues to provide the community with amenity, biodiversity and productivity values now and well into our future. Other deserving nominees for this year’s award included Brian Douglas, Jeanette Elliott, Janet Phillips, Sandra Robinson and Phillip Simpson. Grant Fensom, who was recognised with the award in 2016 and as the Young Citizen of the Year in 1995, was again nominated along with Danny Taylor from Port MacDonnell who received a special commendation from Council. The Carpenter Rocks Progress Association has been named as recipients of the Community Event of the Year Award for their community led project to upgrade and add amenities to the Carpenter Rocks Hall. The project was a true community event involving many local individuals and businesses and it helped bring the small community together. Community members were enthusiastic to be involved in the building process and very proud to see the finished result, which is aimed primarily at attracting school groups who visit for Generations in Jazz. Council invites the public to attend its free family focused Australia Day Celebration at Mil-Lel where the awards will be presented. Starting at 11.30am the celebration offers free children’s merry-go-round and jump castle, music by the Mount Gambier City Band and a BBQ and salad lunch for a gold contribution. Official proceedings and award presentations begin at 1.15pm and it would be wonderful to see as many people as possible there to acknowledge those who make a difference to the District Council of Grant community. The 2019 Australia Day Award nominees and recipients have been announced Mayor Des Noll had the privilege of announcing the recipients of the 2019 Wattle Range Council Australia Day Awards. Mayor Noll said - “These awards acknowledge the fantastic contribution and services provided to the community by these hardworking individuals and groups right across our Council area”. “Each one is a worthy recipient, to be congratulated and commended for their awards, and indeed their contribution to making Wattle Range a great place to live and work.” Mayor Noll went on to say. Mayor Noll will be attending the celebration at Penola to make the Riddoch Ward presentations and Deputy Mayor Glenn Brown will present the Sorby Adams awards in Kalangadoo, whilst the other awards will be presented by the respective ward elected members at their official function. “I urge everyone in the Wattle Range Council region to come along and join in with the Australia Day celebrations on January 26, 2019,” Mr Noll said. At the Naracoorte Lucindale Council meeting held in December, Mayor Erika Vickery OAM announced the Australia Day Citizen of the Year award recipients. “The Citizen of the Year awards reward and recognise individuals and organisations that have made a noteworthy contribution during 2018, and / or given outstanding service over a number of years, to a local community over and above normal employment duties” Mayor Vickery said. Naracoorte Citizen of the Year – Norma Davis. “There were many good nominations received and choosing the recipients was difficult. I’d like to congratulate Norma Davis, Lynette Loechel, Angelique Dellaney, the Lucindale Lions Club and Stephanie Brooker Jones and David Brooker on their awards” Mayor Vickery said. Naracoorte Citizen of the Year, Norma Davis is a caring and community minded person and is well known for her cooking prowess supporting many fundraising, charitable and voluntary services. Norma’s community involvement is extensive and includes the Suicide Prevention Network, the Naracoorte Lucindale Community Care Network, Saint Andrews Presbyterian Church and Soroptimist International Naracoorte. Norma has also been involved in the Kybybolite Football Club and the Migrant Resource Centre English Language classes. Lucindale Citizen of the Year, Lynette Loechel is a quiet achiever for the Lucindale community. Lynette is a life member of the Lucindale PA and H Show, has organised the quilt display at the South East Field Days for many years and recently took on the fashion parade, has been on the LINC Committee for many years and is well known for Fresh Food Fridays. Lynette has also contributed to the Lucindale Area School, Balharry Memorial Kindergarten and Lucindale Girl Guides. Young Citizen of the Year, Angelique Dellaney has demonstrated her dedication, commitment and participation in many school and community activities. Her selfless determination to help others shows courage and is admirable. Some of her many contributions include Lucindale Area School Student Representative Council and other school committees, Mental Health Ambassador, Friends with Benefits and Lucindale Netball Club. Angelique was a recipient of the Premier's ANZAC Spirit Award in 2018. The Lucindale Lions Club hosted the fortieth South East Field Days in 2018 and the Event of the Year award recognises the positive contribution of the South East Field Days to the community over forty years. The Lucindale Lions Club through the money raised at the South East Field Days is a strong supporter of the local and wider community particularly education, health and sporting bodies. Recently the Lucindale Lions Club initiated the Yakka Park Music Festival which is also giving back to the community. A certificate of appreciation has been awarded to Stephanie Brooker-Jones and David Brooker for their contribution to the wool industry and shearing. David and Steph were instrumental in starting the Sports Shear Australia Association and have run the Lucindale Sports Shear events for around 25 years. They are both passionate about shearing and the wool industry. They are great promoters of everything to do with wool and shearing and are well known advocators and educators on the topics of shearing and wool. “The Citizen of the Year awards are determined as a result of nominations from the community. I’d like to thank everyone who completed nomination forms and encourage people to renominate next year. We know that there are many people who contribute It was disappointing to have no nominations for the Naracoorte Young Citizen of the Year or the Event of the Year for Naracoorte” Mayor Vickery said. The Australia Day Citizen of the Year Award are presented at Australia Day celebrations on 26 January 2019. Celebrations kick off at Naracoorte at 7.00am at the Naracoorte Town Square with breakfast supplied by local service clubs, entertainment starts from 7.35am. The official ceremony commences at 7.55am. This is followed by celebrations and a community lunch, supplied by community groups, at Lucindale at 11.00am at Centenary Park, Musgrave Avenue.